➤The Vertical Climber simulates natural climber movements to burn calories while strengthening and toning muscles. Users can exercise biceps, triceps, core and leg muscle at the same time. With climbing workout, users can burn more calories than treadmill in the same amount of time. Climb on for a low impact but high intensity workout with every session. 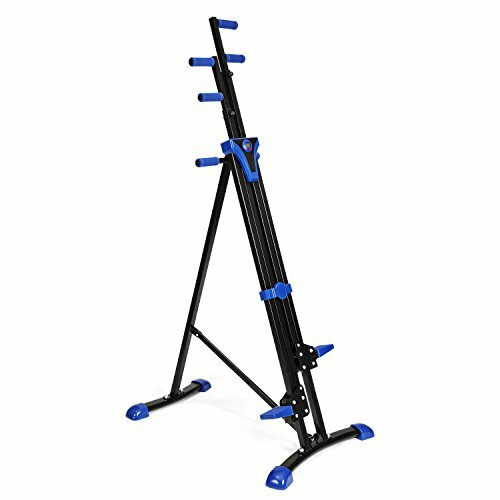 If space is at a premium, it's easy to fold the climber and store it in a corner until your next training session. •Vertical Climber engages all major muscle groups to burn calories and build muscle. •Apply for all body types, features adjustable climbing arms fit different heights. •It has a sleek metal finish, is more stable with rubber non slip pads and has ergonomic grip handles. •The exercise machine is a great item to any home gym! [JUST FOR YOU] When compared to treadmills and stationary bikes, the Anfan Climber helps you burn more calories. Climbing the Anfan Climber for an hour will burn an average of 500 calories with Anfan Climber, you get a full body workout that combines weight resistance, muscle toning, and aerobic exercise in one simple step, all in the comfort of your home. Lightweight & durable. [FULL BODY WORKOUT] Perfect for a high intensity cardio session, or a slow burn muscle workout, The Anfan Vertical Climber targets legs, shoulders, hips, glutes, and your body's core. [MULTI-FUNCTIONAL DISPLAY] LCD screen can track your time, speed, distance and calories burned, provides an effective training plan which keeps all of the important data in view throughout your workout. [USER FRIEND] Climber handle surrounds with thick sponge mats. Steel coated with a healthy anti-rust paint. Folding design is convenient and easy to store, put it against the wall or storage room. [GUARANTEED QUALITY] Made of durable Steel alloy, our climber exercise machine is a kind of high-qualified light weight construction, which can hold riders weight up to 350lb and withstand long term use. If you have any questions about this product by Anfan, contact us by completing and submitting the form below. If you are looking for a specif part number, please include it with your message.